Top Indian fashion and lifestyle blog: 5 most important nutrients for your child’s immunity. 5 most important nutrients for your child’s immunity. Being passionate about health, nutrition and fitness, I research and find out a lot about healthy eating, supplements, nutrients, etc. Recently, I picked up a product during Yes Mom campaign. I got excited, intrigued and curious to know more about it. Slowly I started asking mothers around me, started reading more about important nutrients for the child’s immunity and even researched with the paediatrician. Today we live in an age where there are so many toxic elements in the environment around us. The food that we eat is also contaminated with chemicals. In these times, the immunity of small children is getting affected. It is the need of the hour to provide not just important nutrients to young children but also give them immunity boosters. them stronger in an environment outside the home. They should be able to take their immunity to school. Immunity is the body’s resistance power against disease-causing organisms or harmful substances. and eliminates tumours and helps remove foreign compounds. Is your kid less active or falls ill easily despite all your efforts? This could be due to low Immunity. Immunity is the body’s defence capabilities against germs and infections. It is a crucial factor in the overall development of your kid. Proper nutrition is the key to building a strong immunity. 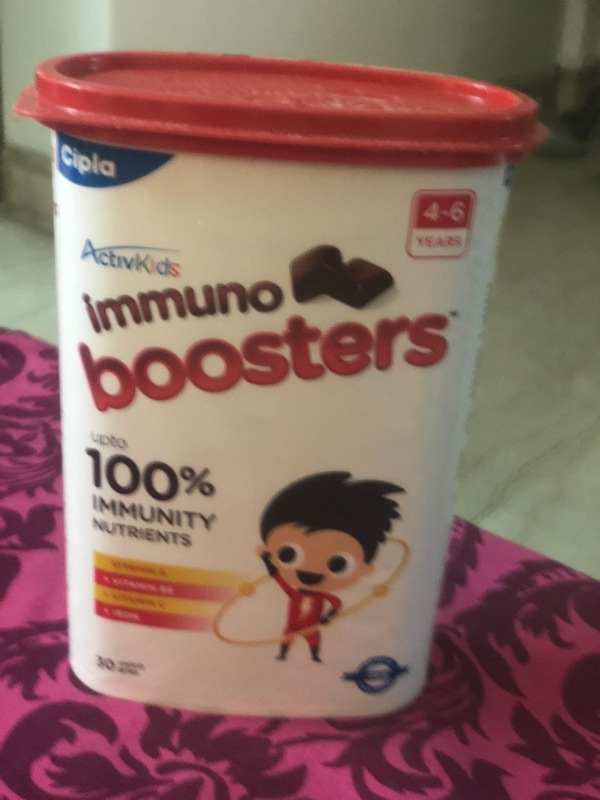 Cipla has thus introduced a wonderful product - ActivKids Immuno Boosters. Apart from the above, it also has Vitamin B1, B2, B3, B6, B12, D3 and Zinc. It is available in a tasty choco-bite format which gives up to 100% RDA (Recommended Dietary Allowance) of key Immunity Nutrients. 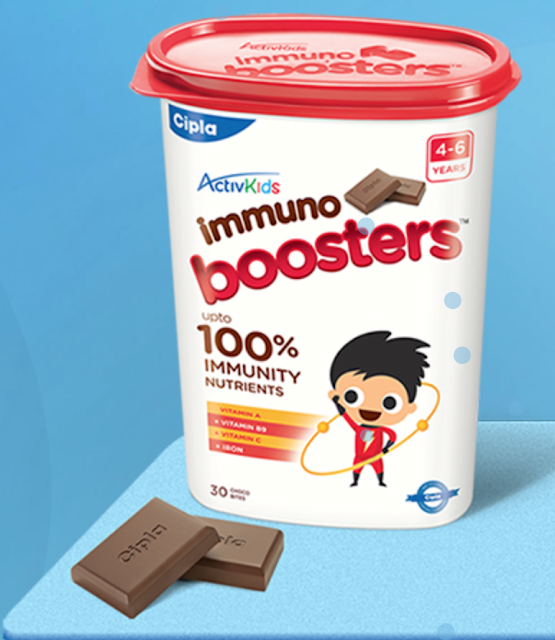 1 choco-bite daily plays a vital role in building your child’s immune system. Extensive research on kids in India and found out that they do not receive even 50% of RDA5 of key immunity nutrients. Further, internal and external factors like pollution, improper diet and lack of physical exercise negatively affect a child’s immunity. Frequent infections due to low immunity lead to a long-term impact on growth and development of kids. 75% kids today are anaemic. 1 out of 3 children suffers upper respiratory tract infections. 4 out of 10 children do not receive full immunization. keeping the Indian situation and the dietary requirements of these children in mind. After discussing with thousands of Indian mothers, it was realized that their kids refused to eat a regular balanced diet. So the company created a first of its kind product that is nutritious, tasty and helps build immunity. no risks of dental caries and high-calorie intake. it was a quick bite after school but he loved the taste so much, he now keeps asking for it, right through the day! but it’s been two weeks and he has been healthy. there’s not even been a sniffle! he did so, with the blessing of his #YesMom! Now, that’s a real game changer. Watch this new video and you’ll be saying Yes too! suppressed immunity, pre-disposal to infections and aggravated malnutrition. and Minerals have been seen to have a positive impact on Immunity. nutrients to young children. You can buy it online or at your local chemist. If you are concerned about your child's health, this is a complete package for you that should be on your priority list.